Sickle cell anaemia is an inherited genetic condition in which there's an abnormality in haemoglobin, the oxygen-carrying protein found in red blood cells. People with sickle cell anaemia have a type of haemoglobin known as sickle haemoglobin (HbS), which is different from normal haemoglobin (HbA). Normal red blood cells can bend and flex easily, and so travel around the blood vessels easily. When sickle haemoglobin gives up its oxygen to the tissues, it sticks together to form long rods inside the red blood cells, making these cells rigid and sickle-shaped. They are then less able to squeeze through small blood vessels. These small blood vessels easily become blocked, preventing oxygen from getting through and causing severe pain and damage to organs. Blockage of a blood vessel causes an attack known as a crisis. This is more likely to happen when the person is stressed by another illness, exhaustion, cold, dehydration, low oxygen levels (such as when flying) and other problems. Organs such as the liver, kidney, lungs, heart and spleen become damaged, causing severe pain, especially in the bones. The red blood cells also break up easily, leading to anaemia. Even without severe crises, chronic anaemia can occur causing tiredness. People with sickle cell disease are also more prone to infection and should see their doctors promptly if they think they have any infection. The majority of people with sickle cell disease are of African or Caribbean descent, although it also affects those from Asia, the Middle East and the eastern Mediterranean. Everyone has two copies of the haemoglobin gene, one from each parent. 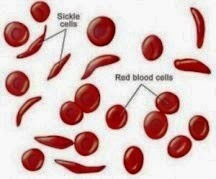 Those with sickle cell anaemia have two HbS genes. Those who have one HbA gene and one HbS gene are said to have sickle cell trait and are referred to as carriers. There are 240,000 carriers of sickle cell anaemia and they're only at risk of problems under extreme conditions, such as during major surgery. Testing during pregnancy, from 11 weeks and usually with CVS (chorionic villus sampling), can identify the haemoglobin type of the baby, while adults can easily be screened. It's important for sickle cell patients to try to keep healthy. A good diet, supplements of folic acid, vitamin D and zinc, avoiding smoking and alcohol (both of which can affect the condition of blood vessels). Vaccination against infections such as flu, pneumococcus meningitis and Hepatitis B will all help reduce the risk of a crisis. Some patients are given long term antibiotics. Constricting garments, Over exertion, Dehydration and Cold temperatures. There's no cure for sickle cell anaemia, but the frequency and severity of crises and their complications can be reduced by avoiding the triggers and prompt recognition and treatment of a crisis. Bone marrow transplants have been used in some cases and, while it is still early days, the procedure holds promise for the future. Transplants offer a possible cure by providing a source of normal blood-making cells. However, they must be done very early in the disease, before the condition damages vital organs. UK guidelines recommend that all children under 16 with sickle cell disease have the opportunity to discuss bone marrow transplant with a specialist – this should include the risks (including an approximate five per cent risk of death), success rates (around 85 per cent) and the difficulties involved in finding a donor (at best around only one in ten of those with sickle cell will have a matching donor).